SOLAR FLARE LEAVES SUN QUAKING Scientists have shown for the first time that solar flares produce seismic waves in the Sun's interior that closely resemble those created by earthquakes on our planet. The researchers observed a flare-generated solar quake that contained about 40,000 times the energy released in the great earthquake that devastated San Francisco in 1906. The amount of energy released was enough to power the United States for 20 years at its current level of consumption, and was equivalent to an 11.3 magnitude earthquake, scientists calculated. 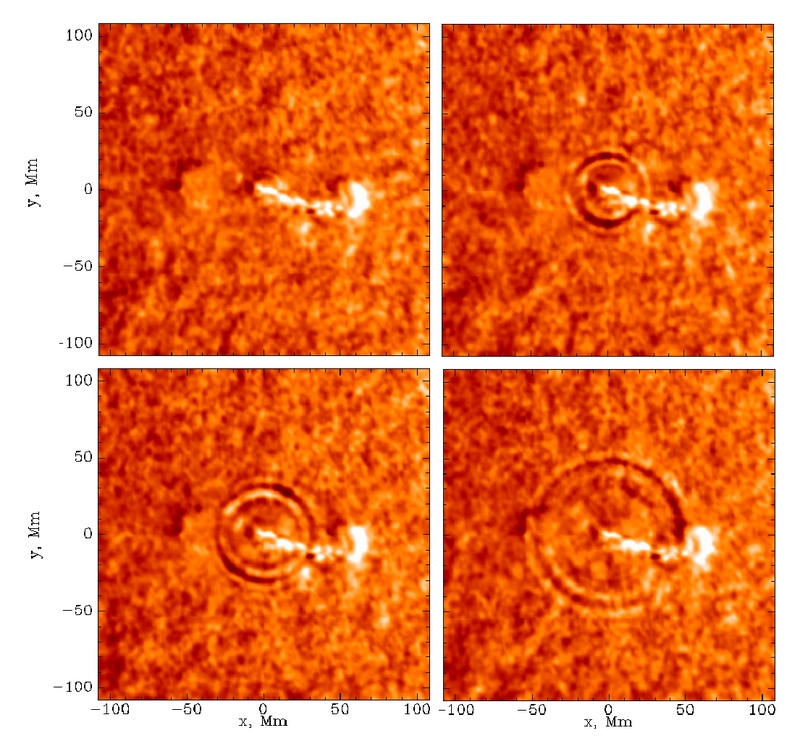 Dr. Alexander G. Kosovichev, a senior research scientist from Stanford University, and Dr. Valentina V. Zharkova from Glasgow (United Kingdom) University found the tell-tale seismic signature in data on the Sun's surface collected by the Michelson Doppler Imager onboard the Solar and Heliospheric Observatory (SOHO) spacecraft immediately following a moderate-sized flare on July 9, 1996. "Although the flare was a moderate one, it still released an immense amount of energy," said Dr. Craig Deforest, a researcher with the SOHO project. "The energy released is equal to completely covering the Earth's continents with a yard of dynamite and detonating it all at once." SOHO is a joint project of the European Space Agency and NASA. The finding is reported in the May 28 issue of the journal Nature, and is the subject of a press conference at the spring meeting of the American Geophysical Union in Boston, Mass., May 27. The solar quake that the science team recorded looks much like ripples spreading from a rock dropped into a pool of water. But over the course of an hour, the solar waves traveled for a distance equal to 10 Earth diameters before fading into the fiery background of the Sun's photosphere. Unlike water ripples that travel outward at a constant velocity, the solar waves accelerated from an initial speed of 22,000 miles per hour to a maximum of 250,000 miles per hour before disappearing. "People have looked for evidence of seismic waves from flares before, but they didn't have a theory so they didn't know where to look," says Kosovichev. 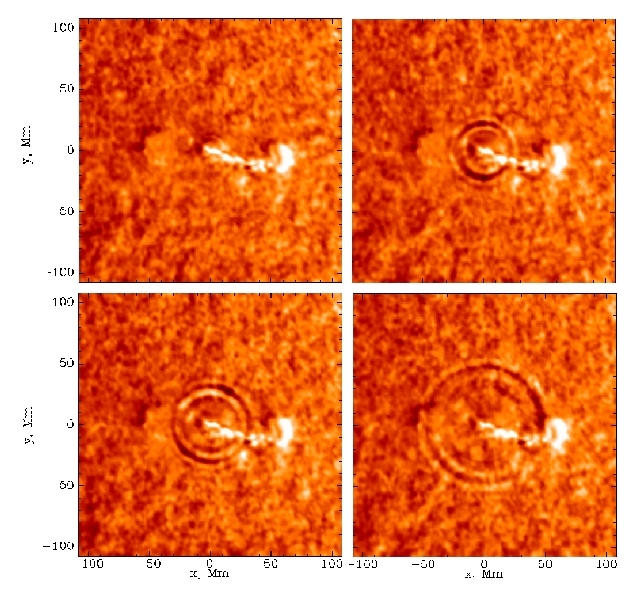 Several years ago Kosovichev and Zharkova developed a theory that can explain how a flare, which explodes in space above the Sun's surface, can generate a major seismic wave in the Sun's interior. According to the currently accepted model of solar flares, the primary explosion creates high-energy electrons (electrically charged subatomic particles). These are funneled down into a magnetic flux tube, an invisible tube of magnetic energy, and produce X-rays, microwaves and a shock wave that heats the solar surface. Kosovichev and Zharkova developed a theory that predicts the nature and magnitude of the shock waves that this beam of energetic electrons should create when they slam down into the solar atmosphere. Although their theory directed them to the right area to search for the seismic waves, the waves that they found were 10 times stronger than they had predicted. "They were so strong that you can see them in the raw data," Kosovichev says. The solar seismic waves appear to be compression waves like the "P" waves generated by an earthquake. They travel throughout the Sun's interior. 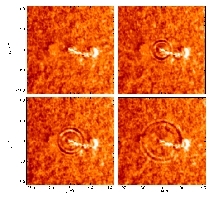 In fact, the waves should recombine on the opposite side of the Sun from the location of the flare to create a faint duplicate of the original ripple pattern, Kosovichev predicts. Now that they know how to find them, the SOHO scientists say that the seismic waves generated by solar flares should allow them to verify independently some of the conditions in the solar interior that they have inferred from studying the pattern of waves that are continually ruffling the Sun's surface. SOHO is part of the International Solar-Terrestrial Physics (ISTP) program, a global effort to observe and understand our star and its effects on our environment. The ISTP mission includes more than 20 satellites, coupled with with ground-based observatories and modeling centers, that allow scientists to study the Sun, the Earth, and the space between them in unprecedented detail. ISTP is a joint program of NASA, ESA, Japan's Institute for Astronautical Science, and Russia's Space Research Institute.